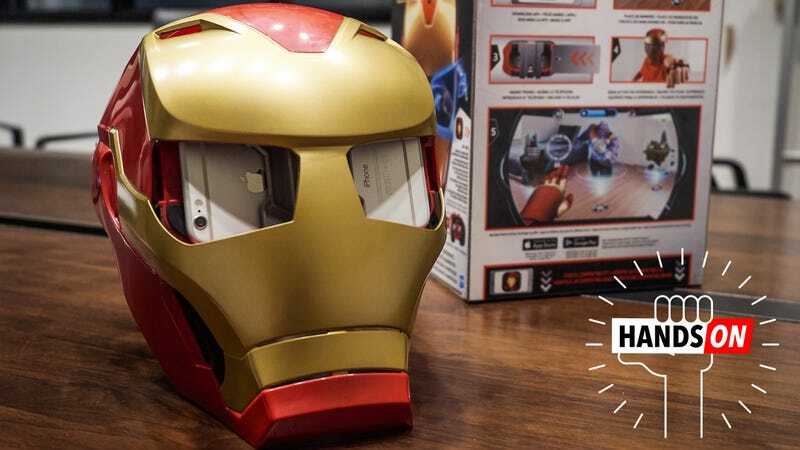 It makes absolutely perfect sense that augmented reality would find its way into an Iron Man toy. Tony Stark and AR go together like peanut butter and jelly. The Iron Man films, borrowing inspiration heavily from Minority Report, show an alternate universe where a man can slap on a tiny headset and get a cool computer graphics overlay onto his very real world. When Apple and Google both announced AR toolkits last year, it seemed like only a matter of time before we saw AR experiences that let you play pretend like you’re in an Iron Man suit. And it was. But what’s really surprised me about Hasbro’s new Hero Vision Iron Man AR Experience is that it costs just $50. For everything that’s included that feels like a pretty nice bargain for baby’s first augmented reality experience! Disney and Lenovo’s comparable Star Wars AR experience goes for $200—a price we felt was simply too much when we reviewed it last year. To be fair to Lenovo and Disney the tech behind its AR setup is far more sophisticated than Hasbro’s new Hero Vision experience. The Lenovo headset uses mirrors to bounce the images from the phone onto your eyeballs, which means you can see the whole world with the AR appearing as translucent images in front of you. The Hasbro experience simply sticks the phone right in front of your face and uses the camera to visualize the room—which means if your camera is dirty or busted, or if someone sticks a finger over it, you will be blind. The Disney experience is also more robust than what Hasbro’s Hero Vision will provide, with multiple game types and a big glowing lightsaber and positional tracking beacon. The Hero Vision AR game is super-simple by comparison. Instead of a big headset with mirrors, there’s just a small set of goggles that are clearly intended for kids (I had to remove my glasses in order for the googles to fit flush against my face). For positional tracking purposes there are three distinct cardboard cut-outs, that you can place on any surface (Hasbro claims it chose cardboard so you can easily print out more if your original cut outs get lost or destroyed). Instead of a cool lightsaber you get a dinky little piece of plastic you strap to your hand. It’s meant to look like Iron Man’s gauntlet and includes two slots for Infinity Gems—Gems that, by the way, will be important as Hasbro updates the game over time. It claims that each Gem will give you special abilities so you can mix and match for your preferred playstyle. Hero Vision includes a mask, AR headset, three cardboard cutouts for positional tracking, one gauntlet, and a single Infinity Stone. The gauntlet has more positional tracking markers on it, so the Hero Vision game will sense it as soon as it sees it. Your phone slots into the headset very easily. There are slots for two Infinity Stones on the gauntlet, but the gauntlet itself feels kind of dinky. If you wear glasses you’ll need to take them off to use the AR headset. Fortunately the lenses inside the headset are extremely adjustable so they’ll work for a wide range of kids and adults. Hasbro has a handy cut out on the box so you can see if your phone will actually fit in the headset. The game itself is also super-simple. There’s only one game mode—where you protect up to three towers from Thanos’s forces. You tag bad guys by looking at them, then attack them by raising the gauntlet, which then shoots out missiles. When the bad guys respond with their own missile you raise the gauntlet and but twist it around so your palm is facing you, which creates a shield to keep you alive. The game is one of attrition. Bad guys come in waves that you must defend against and survive. The game ends when you die or the towers you’re protecting collapse. It’s a very simple game, and alone doesn’t feel worth the cost of admission—but it’s not just a game! The Hero Vision experience also includes a fun Iron Man mask you strap to your face, and you don’t have to use the mask with the AR kit. So one child can run around holding the AR goggles to their face and killing digitally created Thanos minions while the other kid can run around with a mask strapped to their face and kill Thanos minions forged in their imagination. It’s like two toys for the price of one. And it probably won’t be the only toy of its kind we see in the next year. Hasbro hasn’t said if we can expect other heroes to get their own versions of Hero Vision, but I wouldn’t be surprised to see a Captain America or Black Panther version by year’s end. Nor would I be surprised if we see something similar for other franchises—like Transformers, Power Rangers, Star Wars, or Batman. Wherever a mask or helmet on a popular character exists, now there’s an opportunity to create an inexpensive AR game too. The Hasbro Hero Vision Iron Man AR Experience will go on sale later this year and retail for $50. You’ll have to provide your own phone to play the AR game, but the mask will need little more than your imagination in order for a fun time to be had.